This tutorial is designed as help to my patterns. Dc2tog- (Yarn over, insert hook into next st and draw up a loop. Yarn over and draw through 2 loops) twice, yarn over and draw through all 3 loops on hook. Sc2tog- Yarn over, insert hook into next st and draw up a loop, again, yo, insert hook into next st and draw up a loop,yarn over and draw through all 3 loops on hook. Great tutorial and wonderful pictures! Good pictures always help! Great! Thank you so much for sharing! 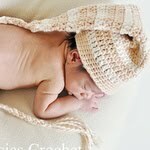 "Peas in a Pod" baby hat. PDF Pattern. 6 sizes. 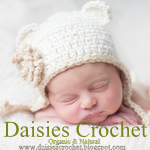 Three Little Bears earflap hat. Pattern "Versatile Beanie Hat" 8 sizes. Pattern "Elf Hat with Long Tail"